Will Teak prices be cheaper direct from Myanmar? - St Angelo Hardwoods, Inc.St Angelo Hardwoods, Inc. In a nutshell, no. There are many contributing factors concerning price increases in the not so distant future. Some have already started to effect pricing. You will see increases throughout the industry from all vendors. St. Angelo Hardwoods has decided to take a stepped approach to increases, meaning that we will not raise prices all at once but will do so on a cost averaging approach. Because we have such a large supply and purchase on a regular basis, we will be able to phase in the increases rather than quickly jumping prices. We covered supply in part 1 so we know supply will be there. 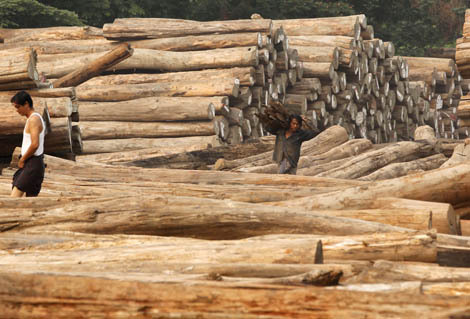 As of April of 2014, Myanmar will cease to sell logs out of country to enable the Myanmar people to find jobs, to protect the environment and to supply stock which is value added. Value added simply means production of sawn timber and other finished products will be done in Myanmar. This takes additional labor and modernized facilities to accomplish. Therefore, adding to the price of teak and other species originating in Myanmar. Procedural enforcement and implementation will be overseen by the Ministry of Environmental Conservation and Forestry. (MOECAF) Why it isn’t simply MECF is beyond me. Higher duty and taxes also accompany a more refined or value added products. Some of these taxes have already been implemented and will increase over time. Someone, somewhere will pay more and therefore, so will the rest of the people using teak. Teak logs are sold at tender (basically an auction) every month at a given time. Logs are sold to the highest bidder, of course. Mills are already hurrying to purchase as many logs as possible to fill the needs of their customers and having to outbid other mills in order to satisfy demand. Again, higher prices will be paid all over. Adding to this already depressing scenario, Myanmar Timber Enterprise (MTE), which is the government agency in charge of all of these logs and actually holds tender on a monthly basis, has been systematically reducing the logs available at tender. This practice has been going on for years, but in an effort to be environmentally conscious and to produce jobs for the people of Myanmar this practice has already been gaining steam.